When students come to college, they bring with them a lot of the same habits they had in high school. Among these are their study habits, which will end up proving essential to their success in college. Unfortunately, many freshmen arrive with no studying skills whatsoever, as they managed to make it through high school without ever studying. Below are some tips for people who need to learn how to study. And yes, despite the confidence you might have in yourself, you will need to study in college. First and foremost, it's vital to know when to study. This is probably one of the most fundamental studying skills, and it's extremely simple. Do not try to cram all of the information the night before an exam. Try to review the class material briefly at least once a week. The week before the exam, study a bit at a time, over multiple days. Having some flashcards — even on a smartphone app — and drilling yourself while you're in line for food is a great way to kill downtime and prepare for any upcoming exams. Breaking up the information that you're trying to digest makes it stick in your head longer than trying to cram in a matter of hours does. Most professors provide some sort of guide to their exams, either in their syllabus or before the exam; if they haven't, it's okay to ask if they will provide one. Alternatively, they may also give out review questions. These will keep you from spending hours trying to memorize things you won't need. Whatever information they say will be on the exam, study that first. During every lecture (not just the ones before the exam), take note of anything they say might be a good exam question. Once you understand that material and can do the problems, it's okay to start studying any information they didn't mention being on the test, as it might still appear on the test. Professors won't always tell you every little thing about the exam, and some like to use less important material to make bonus questions. This particular order may not work best for everyone, but it helps a vast majority. Start with the earliest material. By now you may not be as familiar with it, so it's the most important material to brush up on. Work your way from the earliest material to the newest in chronological order. Once that's done, go in the reverse order. This is a good way to test yourself and see if you still remember everything you brushed up on from the older material. Studying alone is fine, but studying with others is always better. Studying alone is fine, but studying with others is always better. Forming study groups can make drilling material easier and a bit more fun. Study groups can be enormously beneficial, as other people can ask you questions and may understand certain concepts better. If even that isn't helping you understand a particular concept, see your professor or TA outside of class; professors are almost always happy to help their students. If you've been following these steps thus far, the last review shouldn't take very long. Drill yourself on the material one more time, and double check yourself on anything you still feel a bit shaky on. Do this the night before, then get a good night's sleep. Getting eight hours of rest the night before an exam is one of the most important things to do. Now that you actually have to study, you'll need that sleep. If you review the material, then go directly from your books to your bed, you have a much higher chance of retaining that information. Now that you actually have to study, you'll need that sleep. Follow these steps, and you can overcome even the most challenging course. 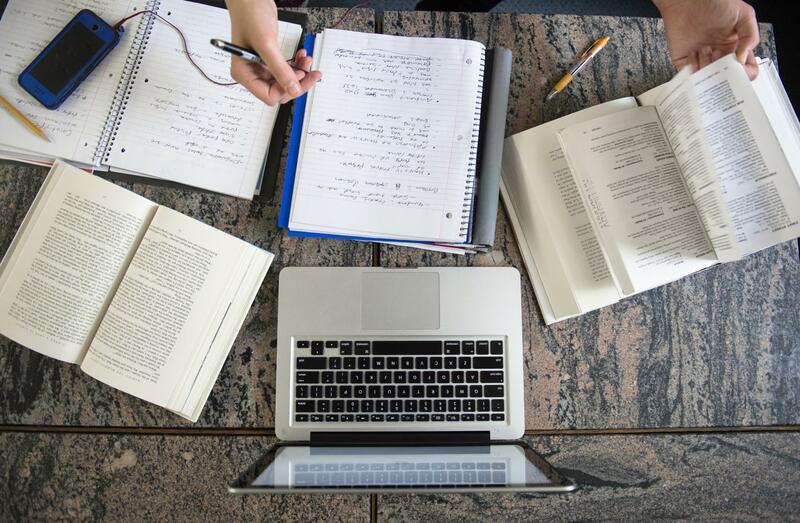 Learning to study from the ground up can be intimidating, but it's vital to your success at RIT.